A rare survivor from a time when witches were hunted and superstition was rife has been unearthed in Newark, Nottinghamshire. Archaeologists have found what is thought to be a “witch bottle” during a dig to pave the way for the £5.4m restoration of the Old Magnus Buildings by Newark and Sherwood District Council and Contractors Woodhead Heritage. The specialist conservation team of Woodhead, Woodhead Heritage are currently refurbishing the Grade II*structure on Appletongate which will house the UK’s first ever National Civil War Centre when it opens in Spring 2015, backed by £3.5m from the Heritage Lottery Fund. Found intact, the 15 centimetre tall green glass bottle probably dates to the 1700s. Experts believe it may once have been filled with fingernails, hair and even urine, all contents linking a building with its owner to ward off evil spells cast by witches. The British Civil War period saw witch hunting reach a deadly pitch. The activities of the self- proclaimed Witchfinder General, Matthew Hopkins, resulted in the execution of as many as 300 people in Eastern England between 1644-46. Such beliefs persisted long after this period even though the laws against the crime of witchcraft were repealed in 1736. 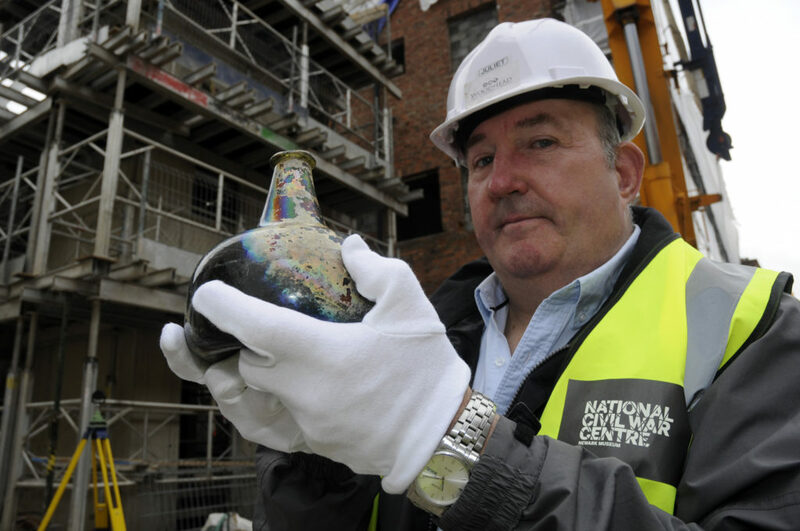 Pictured: Kevin Winter, Collections Assistant at the National Civil War Centre, with the suspected 17th century witching bottle found at the Old Magnus Building, Newark, now being restored by Woodhead Heritage. The British Civil Wars were fought across England, Scotland, Wales and Ireland from 1638 to 1653. Newark, held by the Royalists, played a major role, undergoing three sieges. The last of these in 1645-46 caused terrible suffering. Amazing new archive material will be used together with state-of-the-art technology and hundreds of previously unseen relics to create a unique museum experience at the National Civil War Centre. The attraction is the first of its kind in the UK and has been backed by £3.5m from the Heritage Lottery Fund, £1.9m Newark and Sherwood District Council and £500,000 from Notts County Council. It will also showcase the area’s wider history and link with another exciting project to unravel the secrets of the Civil War siege works around Newark. Pre- Archaeological Services Ltd undertook archaeological investigations at the Old Magnus Building in advance of the main restoration work. Other finds included copious amounts oyster shells, late medieval walls, pottery and a stone lined pit possibly used to produce mortar. Finds were recorded and items recovered conserved and catalogued. A full report is being compiled.